An exchange offer is always lucrative for you. Sometimes this is the best option to convert old from the new one. The precautions of purchasing old to new one given the great happiness on the success of the deal. Users always want to purchase or exchange the used phone with a new one. If you want to purchase the new phone through the exchange offer. You should be very careful to avail of this benefit from the new seller. The seller may be a phone owner, online marketer, and shopkeeper. It is very difficult to select the right person because this will be the first meeting between buyer and seller. You should be conscious during the exchange process and should take some precautionary measures. Some useful tips are given below to save your time for sale and exchange the product. You have to check all points to get the benefit of the phone Exchange offer. Check the actual price of the product, which you want to take. Please ignore to exchange your phone, If the price of your phone is higher than the offer price. Check the exchange offer product details and originality on the company site. Like - Model Number, Android Version, Legal Information, Base-band Version, Kernel Version, Build Number, Installed Application, SD Card and phone storage capacity. Another option is available to sell your phone online. The best online product selling sites is Olx.com and Quikr.com. Both platforms are using a large number of people to sale the old product directly to purchasers. Another precaution should be taken during purchasing the phone by online shopping. Before given the phone to the shopping company you have to take the backup of Memory Card, Data on the phone in your PC. Now delete the rest details from your old phone. 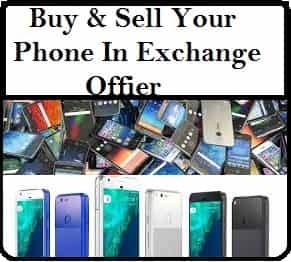 Before submitting your phone to the company in the exchange offer, delete all the data as well as activate factory data reset option for complete formatting of the phone. Another option is for you to use Hard-Boot for data deletion. These tips are helpful to save you from any fraudulent activity.